Andi Bietry slides into third for the Lady Patriots in win over the Lady Bees. 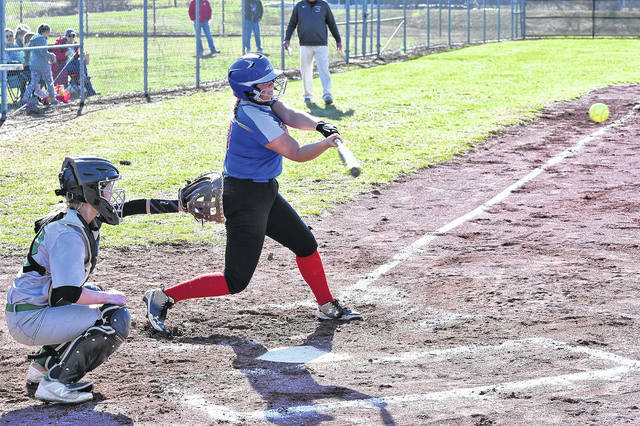 The Lady Patriots’ Grace Lipps takes a turn at the plate in the team’s first win of the season. Kelsey Wehr drives one of her three hits on the day in Lady Patriots win over Bethel. Logan Brooks bats for Tri-Village in win over the Bethel Lady Bees. Loraligh Waters picks up the first win of the season for the Lady Patriots. 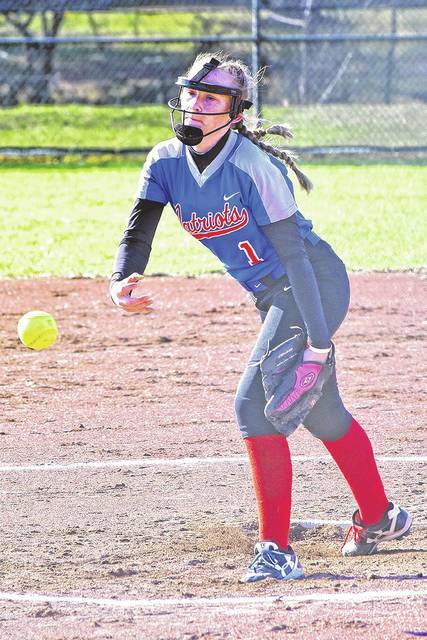 NEW MADISON – The Tri-Village girls softball ball team got their first win of the season and the first win for new coach Abby O’Donnell scoring 9 runs to 1 for visiting Bethel. “It’s nice to get a win, especially at home. We have been preaching hit the ball hard and swing through and we finally started to see the girls do that tonight,” O’Donnell said. The Patriots plated 4 runs in the bottom of the 1st inning and added 2 more in the 2nd inning to put pressure on the Bees. Andi Bietry got it going with a single and a stolen base. Reece Arnette coaxed a walk and then Kesley Wehr singled to drive in a run and Kayleigh Osborne also singled to drive in two more runs. Osborne would score in the inning as well on a single by Logan Brooks to give the PATS a good start with 4 runs in the inning. The Patriots scored 2 in the 2nd inning, 1 in the 4th inning and 2 in the 6th inning for the 9-1 win. Andi Bietry went 2-4 at the plate scoring a run, Reece Arnette was 2-3 with 2 runs scored, Breanna Lipps was 1-4 with a run scored, Kelsey Wehr was 3-3 and 4 runs, Kayleigh Osborne 1-3 and 1 run and Bree Wilson was 1-2 at the plate for the Patriots. Loraligh Waters got the win on the mound for Tri-Village. “Loraligh did an awesome job on the mound, putting the ball into the spots we called for her,” O’Donnell praised. “The girls got their first taste of a good win for the season. I think now that we know what we have to do to be successful, we will start seeing a lot more from each individual player and be more successful as a team,” O’Donnell concluded. The Patriots improved to 1-3 on the year. 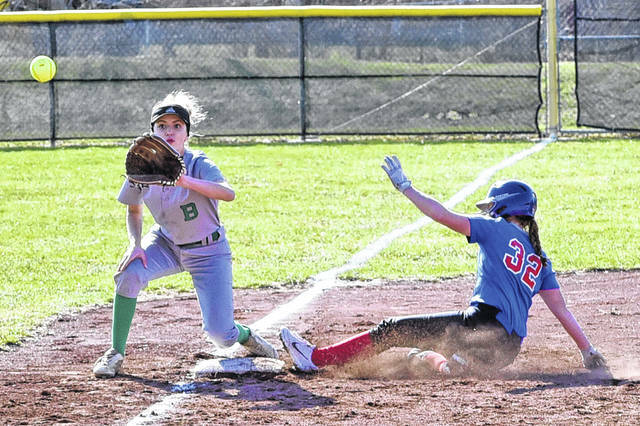 https://www.dailyadvocate.com/wp-content/uploads/sites/34/2019/04/web1_Andi_Bietry.jpgAndi Bietry slides into third for the Lady Patriots in win over the Lady Bees. https://www.dailyadvocate.com/wp-content/uploads/sites/34/2019/04/web1_Grace_Lipps.jpgThe Lady Patriots’ Grace Lipps takes a turn at the plate in the team’s first win of the season. 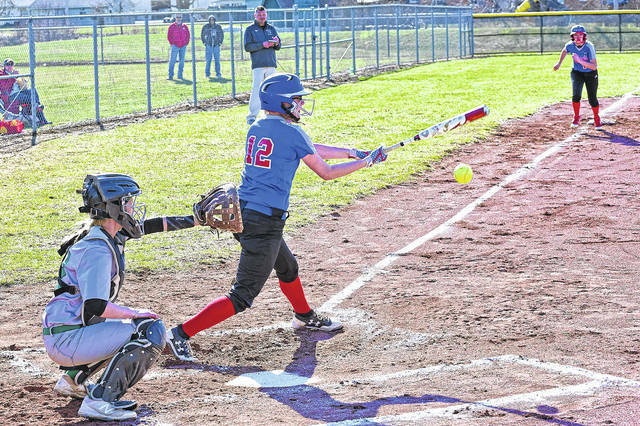 https://www.dailyadvocate.com/wp-content/uploads/sites/34/2019/04/web1_Kelsey_Wehr.jpgKelsey Wehr drives one of her three hits on the day in Lady Patriots win over Bethel. 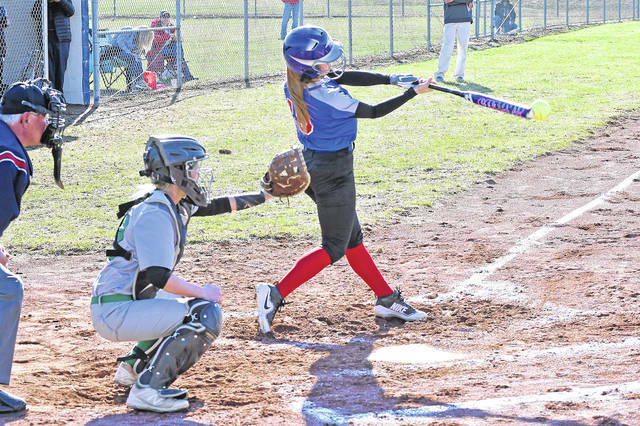 https://www.dailyadvocate.com/wp-content/uploads/sites/34/2019/04/web1_Logan_Brooks-a.jpgLogan Brooks bats for Tri-Village in win over the Bethel Lady Bees. https://www.dailyadvocate.com/wp-content/uploads/sites/34/2019/04/web1_Loraligh_Waters-27693-.jpgLoraligh Waters picks up the first win of the season for the Lady Patriots.